Forget the man in the moon. The internet is all about Planet Hillary right now. 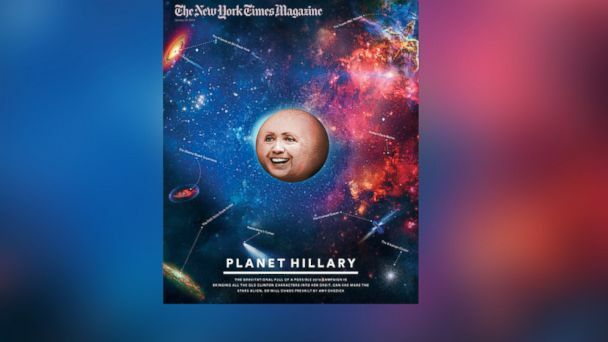 The cover of this week's New York Times Magazine shows Hillary Clinton's smiling face as a planet. In a column explaining the quirky cover idea, the Times said it was meant to symbolize the former secretary of state's "influence on the various people within her political universe." The silly cover got us, and plenty of others thinking: Will Hillary be a wrecking ball in the 2016 presidential election? How would the former first lady, who has a penchant for scrunchies, look if she tried a new hairstyle? Let's see how Justin Bieber's locks look on Planet Hillary. But it is 2014, so perhaps he could also just text. Here's Planet Hillary pounding out a message on her phone. Planet Hillary replaces the moon in everyone's favorite children's book about a celestial body. Finally, the question on plenty of minds before the 2016 presidential campaigns begin. It's Hillary's universe. We're just living in it.